After we were married in July 1947, Albert and I moved from a tied farm cottage in Shopland, Sutton near Rochford, to share a house at Sayers Cottages, Chapel Lane with my parents Harry and Gladys Hopgood. The Abbeyfield House sheltered accommodation now stands on the site of Sayers Cottages. Albert and Harry both worked on the Salvation Army Farm. They were interviewed for their jobs at Park House, The Chase and were granted the princely sum of £3.19s (£3.95) per week. 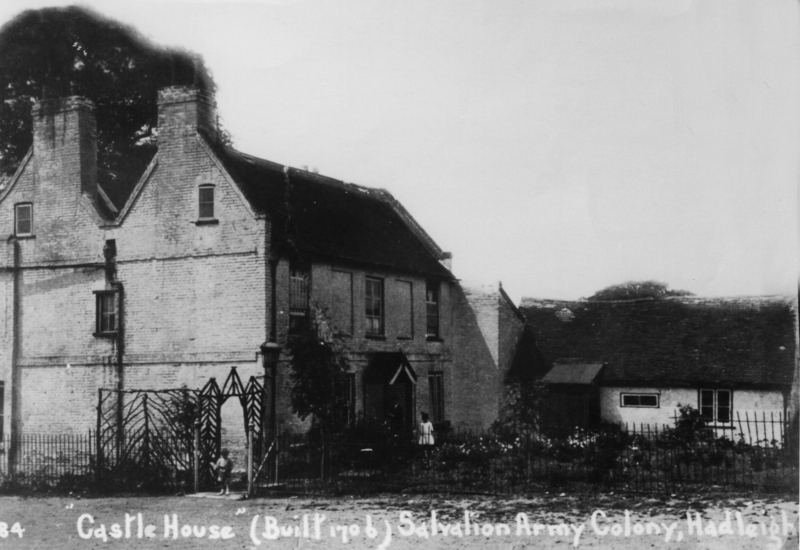 In December 1947, the Salvation Army offered Albert and me the lower flat in Castle House, which was built in 1706 and, much later, was converted into two flats. This was to be our first marital home! The upper flat was occupied by Harold and Alice Nicholls. Castle House was a grand house with wonderful views over the marshes and the Thames Estuary and, to the east, a direct view of Hadleigh Castle. Compared to our previous accommodation, the flat was enormous! It had a large entrance hall leading to six rooms, which included a living room, dining room, large scullery, two bedrooms and a bathroom. In the scullery was a huge eight-foot dresser and a kitchen stove. The floor was made of uneven red bricks, which I covered with lino. In time, the corners of the bricks wore through the lino. At the side of the stove was a large storage cupboard for coal. The only water supply was a cold tap over a shallow, yellow sink. There was no electricity and light was by candles and gaslights in the living and front rooms. I decided to decorate the living room because horse hair was poking through the lathe and plaster walls. Even though I was only 19 at the time and had never done any decorating before, I re-plastered the walls and painted them with green distemper, using a sponge to create a stipple effect. The front room with its two high sash cord windows got similar treatment, but I did not attempt to re-decorate the hall, which was painted in a fetching shade of light brown! The front room had a large open fireplace with steps inside originally for chimney sweep boys to climb up and clean the chimney. One day, our black cat went missing. We only found him, sitting on the second step up inside the chimney, because the white patch on his chest showed up in the black sooty chimney. The bedrooms were so damp that we had to mop the floors before going to bed! In the bathroom there was a bath but no running water as there were no taps, but there was the luxury of a galvanised gas boiler. On bath night, buckets were filled with cold water from the tap in the kitchen and carried from the kitchen through the other rooms to the bathroom. The cold water was poured into the boiler, heated up and poured back into the buckets, which were then tipped into the bath! Beneath the house was a cellar which was always flooded. We were told that a tunnel led from the cellar up to Hadleigh Castle, but no-one was brave enough to see if this was true! After a very stormy night on 31st January 1953, I looked out of the bedroom window to see that Canvey Island was flooded and only the rooftops of houses could be seen above the water. A storm surge from the North Sea had caused one of the greatest disasters in living memory and after devastating the East Anglian coast, had finally breached the sea wall protecting Canvey Island, causing 58 people to lose their lives. Albert and Harry took horses down to the marshes and rescued the stranded cattle that had gone to higher ground. Cattle will not move in such circumstances unless they are led off. 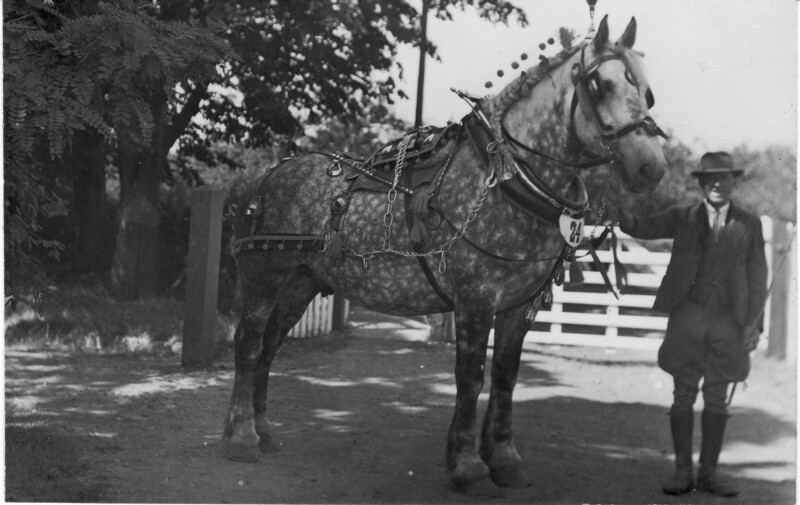 Albert and Harry positioned the horses in front and moved off so that the cattle instinctively followed them. It was an amazing sight that, hopefully, will never be repeated. 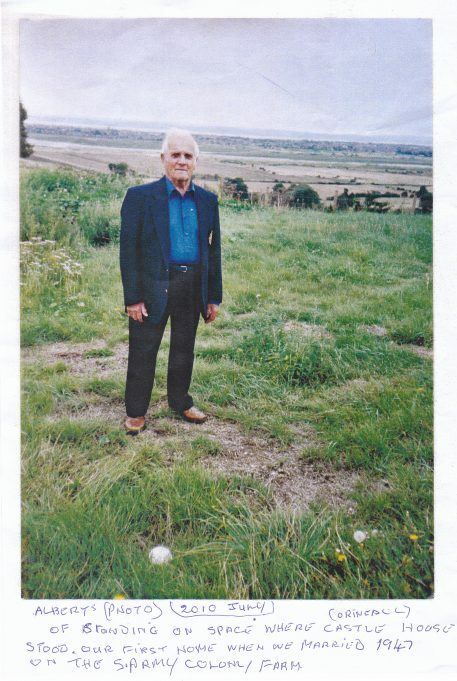 Albert and Harry worked the front fields on the south side of London Road with magnificent Suffolk Punch horses pulling the ploughs. Even by 1947, full mechanisation hadn’t yet reached the Salvation Army Farm! Albert was also given the job of supervising homeless down-and-outs and other unfortunates who were taken in by the Salvation Army to work on the market gardens for a little money. These men were known as “colonists”. We took pity on one of the colonists, Bob Finch, who was disabled and lonely and invited him into Castle House for evenings and at Christmas and holidays. Bob continued to visit us for the next 29 years! Every Tuesday and Friday, at 11.50 am, it was the custom to ring a bell to remind all the workers that it was time to attend for prayers before lunch in the dining hall, which was adjacent to Castle House, near the site of the new Tea Rooms. Great to read your story – did you move out in 1953? My Mum and Dad (Mildred and Peter Howard) moved into Castle House in the same year. By the time I was born in 1964 Castle House was one house on three levels plus the cellar and we lived there until it was demolished. At this point we moved across the road to West View. Then a new farm house was built – opposite the Dining Hall which we moved into in 1980. Would Sayers Cottages have been opposite Holbro House No. 40 Chapel Lane? If so, I remember them well when visiting my Paternal Grand Parents, Alfred Hawks at No 40.